I grew up on Staten Island, NY and went to college on the Jersey shore, so the fashion odds were clearly stacked against me. I was destined to become another Juicy Couture clad girl with blonde highlights and bedazzled dreams. Only it didn't quite work out that way (thankfully). But yesterday when I popped into H&M to checkout the Anna Dello Russo (ADR) for H&M collection, Staten Island & New Jersey were all I could see. 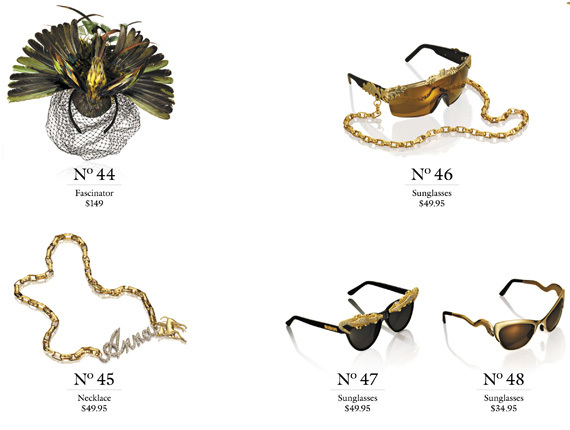 ADR clearly subscribes to the blinged out, sexed up, over-the-top aesthetic that is so ubiquitous in these places. The fashion community may hate me for saying this, but what else should one expect from a a 50 year old woman who frequently wears the bittiest of skirts, plunging necklines and skin tight cut-out dresses?! As Vogue Japan's editor at large, ADR undoubtedly has big time fashion chops and a unique point of view, but this doesn't translates into designing pieces that women actually want to wear. The collection looks like ADR knocked off designs from Rainbow, Charlotte Russe and Joyce Leslie; it is chock full of gaudy costume jewelry, shoes and accessories with over-the-top price points to match. Rhinestone encrusted sunglasses with a chain for $50.... thigh high stiletto boots for $300... a chain belt with a four leaf clover and cherry charms dangling for $130. A turquoise plastic satchel for $60. A blinged out "Anna" nameplate necklace for $50. Clutches that hold little more than lipstick for $100. Vegas show girls, strippers and club hoppers might put the collection to good use, but for the rest of us it's a bit ostentatious and dysfunctional. It seems ADR for H&M and our existing wardrobes are simply oil and water... they don't mix. Unlike the coveted Marni for H&M collection that sold out within hours, ADR is still on the shelves nearly a month after its release(October 4, 2012). Much to H&M's chagrin, this collection probably won't sell out until they put it on clearance. The verdict: I won't be buying Anna Dello Russo for H&M. Most pieces are too over-the-top for my sensibilities and the price points are too high to justify cost-per-wear. I'd say it's a poor investment to buy something from this collection because it's likely that you will never even wear it. What are your thoughts on the collection? What is your favorite designer collaboration to date? Leave your comments below. You totally nailed it! When I saw the video for this collection I was like ummm...no. I will not be driving over an hour to my h&m for that. A friend of mine whose style is very much Joyce Leslie (omg I haven't heard that in years, can't believe they still exist) was like woah I love this should we go haha. Thanks for stopping by, Ria. hahahaa... I'm glad to know I am not the only one who wasn't a fan of the collection! Ouch Ouch Ouch! Even without seeing the collection in person I trust your judgement based on the pix laid out. It seems a bit overpriced for regular items. maybe a second collection will be better?? lol... Judging by this one, I doubt they will ask her to return... but hey you never know... second time could be a hit.